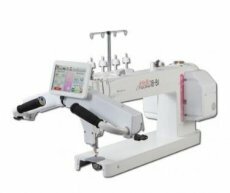 Perfect for Your Hobby or Your Quilt Business: The Artistic Quilter 26dx offers the space, speed and precision to quickly finish any size quilt! The large 26" throat opens you up to larger quilting motifs. The built-in lighting makes sure you always know where you are going and the adjustable handle bars make sure you're comfortable creating. 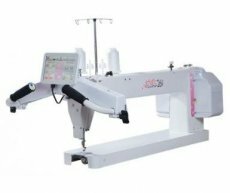 •Buy the optional Artistic Robot* automated robotic quilting system to be fully integrated with our all new ESP machine stitch regulator. Simply attach the hardware, plug it in, and you have a fully-automated system. Smooth, simple and precise—the Artistic Quilter 18-8dx gives you the freedom to stitch your Artistic vision. With an 18" throat and 8" height, you can roll even bigger quilts without sacrificing any throat length. Move easily and freely on your quilting frame. The ultimate addition to a crafter's workspace! 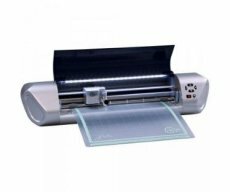 The Edge digital Cutter 12 opens up a new world of custom cutwork designs for paper crafting, quilting and embellishing. 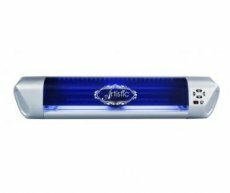 Let LED lighting and a placement laser make every cut more precise than you could have imagined. The Edge 12 comes with adjustable blade holder, 3 cutting blades, pen holder and pens, 12" x 12" low tack cutting mat (for thinner and more delicate materials like paper or fine fabric), 12" x 12" high tack cutting mat (for thicker materials like template material or foam core), and the Artistic SimpleCut software containing 3,500 designs.